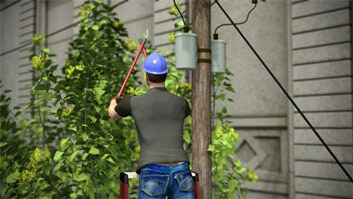 There are three major elements typically installed between main power lines and a motor. These are - circuit breakers, contactors and overload protection devices. 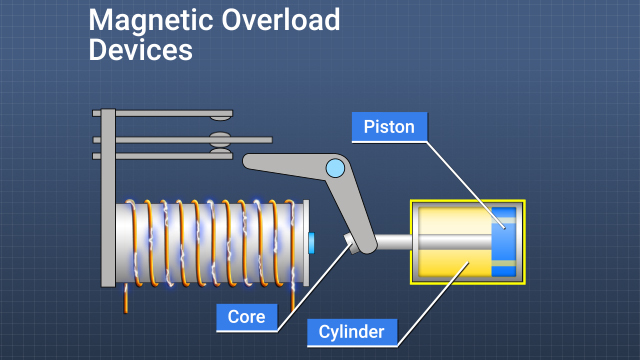 In order to prevent transient current spikes from activating them, magnetic overload devices incorporate a mechanism to slow the movement of the solenoid plunger, or core. Electronic solid-state overload devices use current transformers as sensors to generate a current signal that they can monitor and act upon. 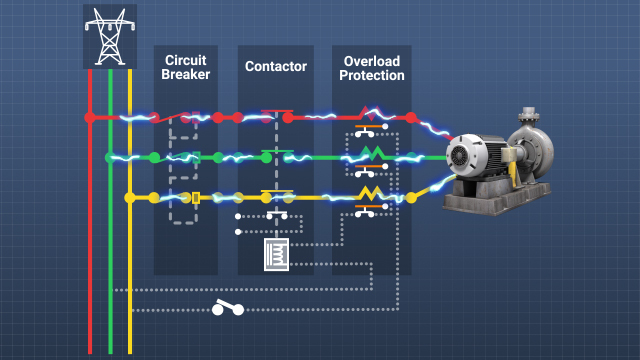 Large alternating current motors are vital to modern life and industry. While motors are relatively simple devices, they can be installed or operated incorrectly or develop operational problems. For protection of the motor and for safety reasons, electrical motors require protective devices on their power supply systems. 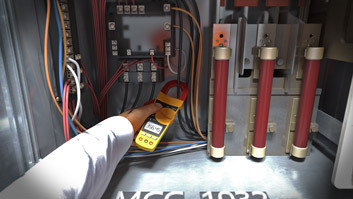 Circuit breakers and fuses are used to provide protection from very high-current short circuits and ground faults. Overload devices are used to protect from longer period, moderate overcurrent events. 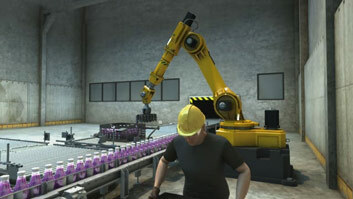 This module will focus primarily on the role and function of the overload protection devices. What is the difference between circuit breakers and overload protection devices? 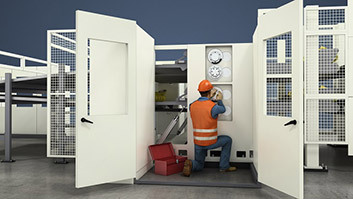 Circuit breakers operate by stopping power in very high overcurrent situations such as those that would occur from a short circuit or a ground fault. An overload protection device is meant to protect a motor from operating for prolonged periods of time at a current that is moderately above full load amperage. What are some conditions that can lead to motor overloading? Motor overloading can be caused by an increase in the load being driven by the motor, bearing failure in the motor or the driven load, or an electrical problem such as a low input voltage or single phasing. How does a bimetallic overload device work? Bimetallic strips bend when heated. In an overload device, a small heater is wired in series with a motor winding. If excessive current flows through the heater, it causes the strip to bend sufficiently to open the contacts that supply power to the motor winding. 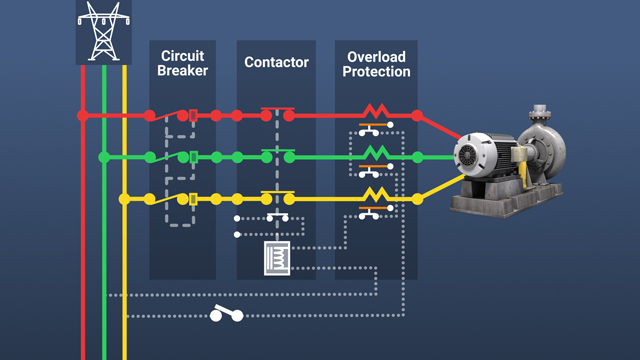 What role do current transformers play in overload protection? 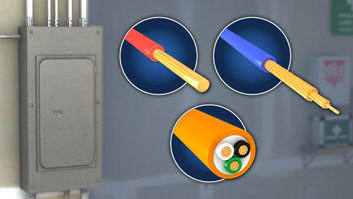 Current transformers are sensors that surround a power conductor line. 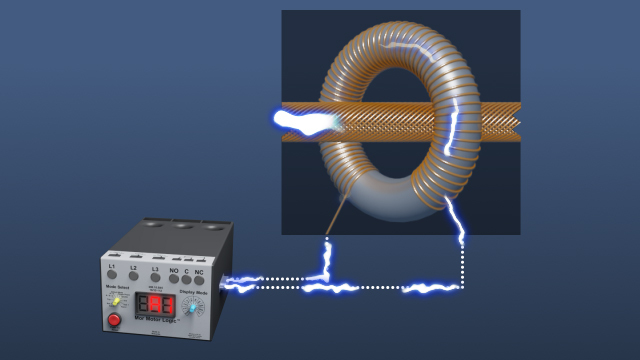 By electrical inductance, the flow of current in the transformer is proportional to the flow in the primary conductor. The reduced current in the transformer circuit permits the use of smaller overload devices. What does the NEMA trip class of an overload device indicate about the device? The NEMA trip class is the number of seconds required for the overload device to trip at a current of 600% of the full load amperage of a motor. There are several types of overload devices which can be placed in line with a motor winding to prevent damage from overheating. Two types of devices rely on a thermal element for protection. The first uses a bimetallic strip. A bimetallic strip consists of two strips of metal bonded together. As the temperature of the strip increases, the metals expand at different rates, causing the strip to bend. This bending upon heating can be used to make or break contacts in an overload device. In the diagram shown, an electric heater in series with the winding of a motor generates heat in proportion to the current flowing through the motor. If the current increases, the heater generates more heat, the bimetallic strip bends and opens the contacts which trips out (or stops) the motor.